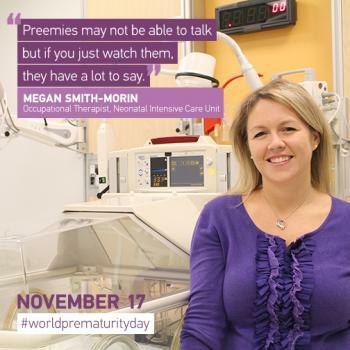 November 17th marks World Prematurity Day. 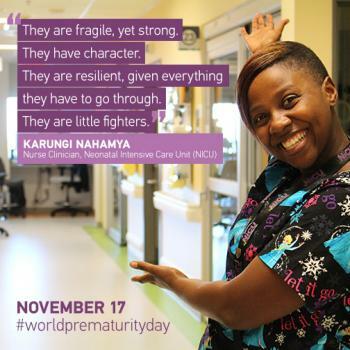 Every year, approximately 15 million babies are born prematurely, accounting for more than one in 10 of all babies born worldwide. Join us in thanking all of our Neonatal Intensive Care Unit (NICU) and new Neonatal Follow Up clinic staff for the indispensable work they do every day! Some of Megan’s recommendations may involve decreasing environmental stressors such as lights, sounds and touch, or positioning strategies in the bed or in parent’s arms so that parents can benefit from bonding with their baby.